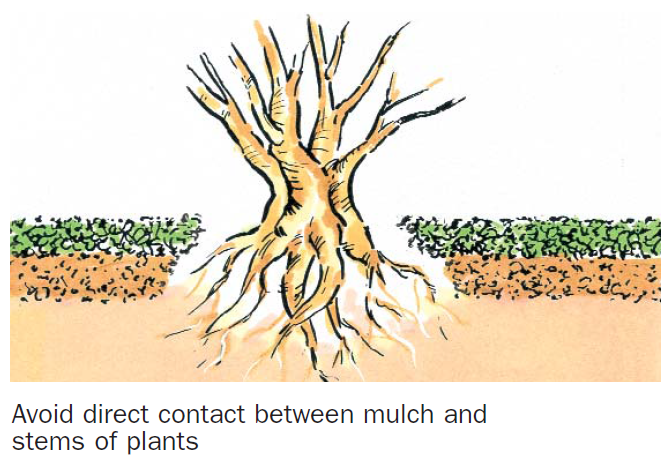 Mulch is a natural or man-made soil covering that protects plant roots from temperature extremes and conserves soil moisture. 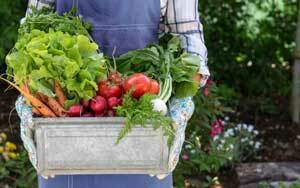 Home gardeners have a responsibility to the environment through conservation of natural resources. 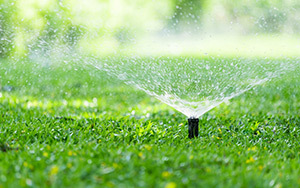 Now that the ‘user pays’ billing system is fairly widespread, the challenge for us all is to use as little water as possible to keep our gardens healthy. That’s where mulching plays an important role and it’s the ideal starting point on the journey to an almost work-free, weed-free garden! proprietary mulches from sawmill and fodder processing wastes, milled and pelletised cereal straw (expands when water is applied). Other natural materials like crushed rock and scoria may also be used as mulches but they will not break down to improve the soil beneath them. There are also man-made mulch materials including proprietary products like Weed Mat. 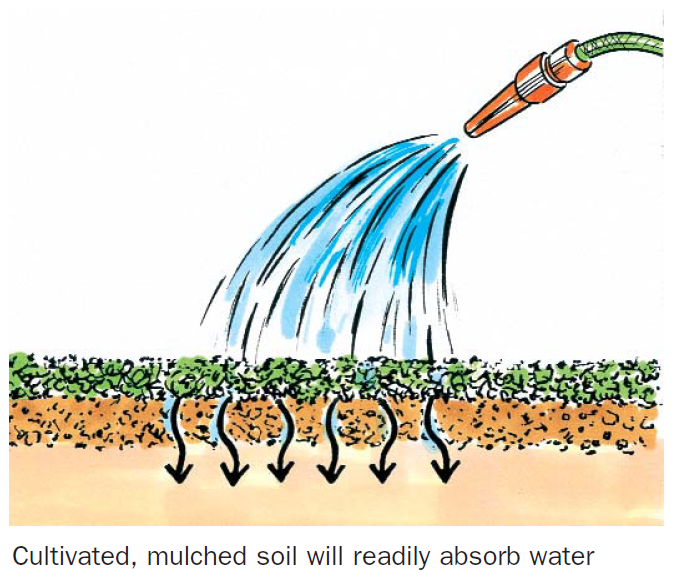 These materials assist in retaining moisture in the soil after watering or rains and certainly provide excellent weed control, but, because they are fairly thin, they do little to control soil temperatures. reduce weed growth by eliminating direct sunlight and smothering any seeds that do germinate. Before applying a mulch, you will need to do some preparation of your garden beds. The area should be completely free of weeds – either hand weed, hoe and rake or use a herbicide. Leave the soil uncovered for a couple of weeks, then repeat the weeding process. Troublesome weeds like couch (which has underground runners) and oxalis (which grows from bulbs) should be sprayed or carefully dug out. Once you have the weeds under control, fork the soil over to a depth of about 15 cm to break up any surface caking and to ensure water can penetrate into the root zone of your plants. 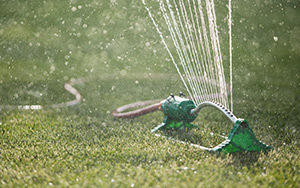 To test the porosity of your soil, hose it for a few minutes and watch for any run-off. If you are using shredded timber or wood chips as a mulch, it is a good idea to add a source of nitrogen such as blood and bone. Once your preparation is complete, water the garden bed thoroughly then spread your chosen mulching material evenly over the soil. Make sure it does not come into direct contact with the stems or trunks of plants as this can cause stem rot. The finest mulches will work well in a 6 cm layer while course materials will need to be spread up to 10 cm thick. They will soon settle to about 6 or 7 cm thick. Well-made compost will not burn plants when it comes into contact with stems or leaves. Composting is a time-tested method of speeding up the natural decomposition by soil-borne organisms of organic matter. Compost bins or heaps which quickly generate high internal temperatures will convert waste materials quickly to good quality compost and won’t create unpleasant odours during the process. Weed seeds and harmful disease organisms will be destroyed as long as sufficient heat is generated. Good compost will get almost too hot to touch rising to at least 60°C. Use a bin to keep the heap tidy and to prevent it from becoming too wet in rainy periods. Homemade bins using chicken wire, timber, cement sheeting and roofing iron are quite satisfactory. However, you may prefer to use plastic, purpose-made bins because they are clean, light, convenient and inexpensive. Talk to your local Home store. While one bin is probably sufficient for the average family, two or three bns are even better. One should be used for fresh material, one should be used for maturing, while the third can be used to store the finished product until you are ready to use it. Ingredients can include kitchen waste (meat bones and egg shells can be included as long as the heap or bin is rodent-proof) and garden wastes such as non-invasive weeds, lawn clippings and shredded prunings. Do not use badly diseased plant material. It is important to start with a good volume of mixed materials so the internal temperature will sufficiently rise to promote breakdown. 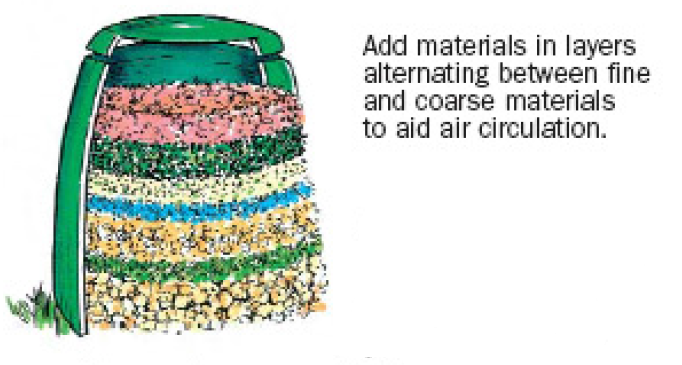 Air is important in the process so mix fine materials like lawn clippings with coarser material. Do not pack or compress the material in the bin as this will exclude air and for best results the wastes should be moist, not wet. If possible, materials should be added in layers between 10 and 15cm thick – a layer of coarse material on the bottom, followed by a thin layer of fine material, topped with coarser material, and so on. Use as wide a variety of organic wastes as you can. For the best quality compost, it is advisable to turn the heap or re-mix the bin regularly. Nitrogen – used sparingly, fertilisers such as blood and bone will speed up the breakdown process. Gypsum – will help reduce odours. Compost Makers/Starters – may encourage the proliferation of soil-borne organisms. Lime – Do not add lime – contrary to popular belief, compost is not highly acidic and the use of lime may make the final product unsuitable for garden beds which contain acid-loving plants such as azaleas, rhododendrons, camellias and magnolias. 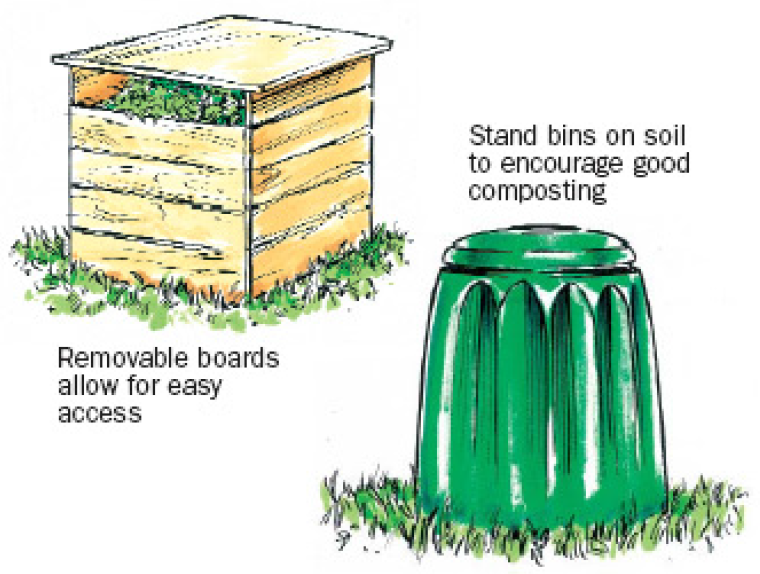 A fully enclosed plastic bin with a lid that seals securely will create compost within about 6 weeks if the bin is located in a sunny position. In mid-Winter, when air temperatures are lower and sunshine short, it may take longer for the process to be efficiently completed. Chicken wire, timber and cement sheet bins may take up to three months as they are often larger and have a greater surface area exposed to ambient temperatures through which heat is lost. The compost is ready to use when all the contents of your bin resemble a rich dark brown loamy sol with no evidence remaining of the various materials used. The compost should be slightly moist and crumble freely when you run your hand through and it should smell “sweet and organic”.